Custom Metal Art - Italien Restaurant Orders Custom Cut Metal Art Made Out Of Stainless Steel. MetalsCut4U offers all customers the possibility to order one piece of sheet metal made out of Aluminum, Stainless Steel or Carbon Steel. your family name on your front door. whatever you could thing of. Today we are featuring a very nice project, that was very easy to do for us, because the customer was able to provide us a CAD drawing (.dwg or .dxf File format). 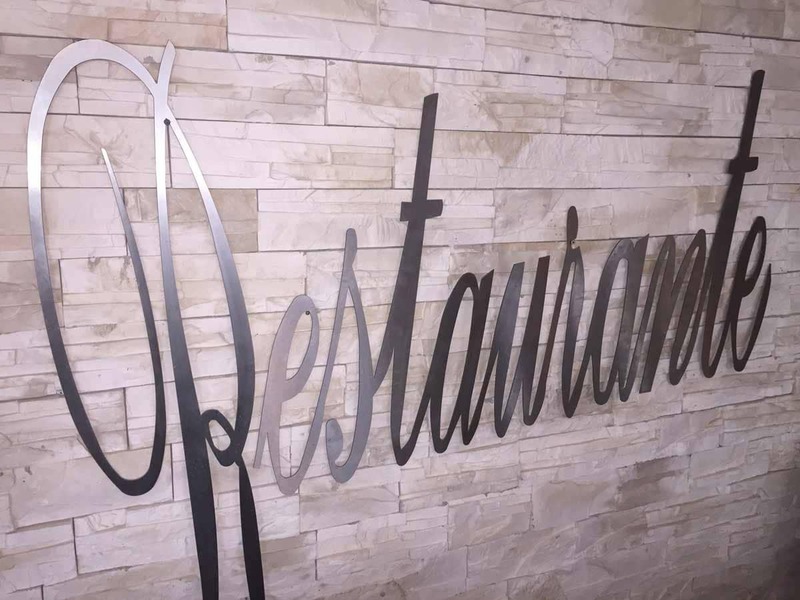 The word “Restaurante” was to be cut out of stainless steel sheet metal. The approximately 5 x 2 feet sized metal art sign was placed on a roman stile stone wall which adds additional flair to the room where it was placed. Now this was a very quick project as the customer was able to provide us almost everything we needed to program our laser cutting machine. The laser cutter quickly was able to cut the metal art sign out of a full stainless steel sheet metal. We know not all customers can provide us with everything we need but that should not hold you back in requesting a quote. You most certainly can send us a picture of what you would like to have cut out of sheet metal. We will be happy to make you an offer. We will be blogging more great ideas from you, our customers, as we will be realizing them for you. Contact us if you have a great idea you think can be done with sheet metal such as stainless steel, aluminum or even carbon steel.